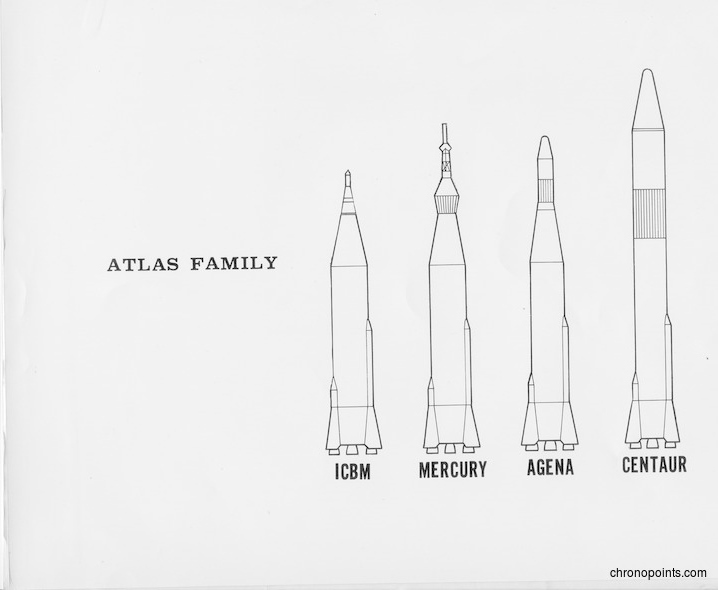 A chart showing the four original configurations of the Atlas family of missiles: Intercontinental Ballistic Missile (ICBM), Mercury-Atlas, Atlas-Agena, Atlas-Centaur. The Atlas booster was originally developed as an ICBM in the mid-1950s. First flown in 1957, the Atlas was eventually deployed to multiple sites for the U.S. Air Force. Early in the manned space program, the Atlas was selected to place the first American astronauts into orbit. 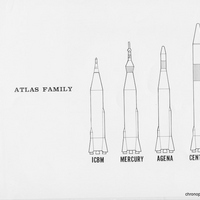 Atlas was retired as an ICBM in the early 1960s and became a civilian launch system. Atlas continued to operate as a civilian launch system until 2004, when the last of the Atlas rockets, based upon the original design, was launched. Original chart: Private Collection of Dr. Calvin D. Fowler. Digital reproduction of original chart. "Atlas Rockets." Historic Spacecraft. http://historicspacecraft.com/Rockets_Atlas.html. “Atlas Family Chart.” RICHES of Central Florida accessed April 21, 2019, https://richesmi.cah.ucf.edu/omeka/items/show/6390.